"Get your gun!" Sam's father said. "The British soldiers are coming this way!" 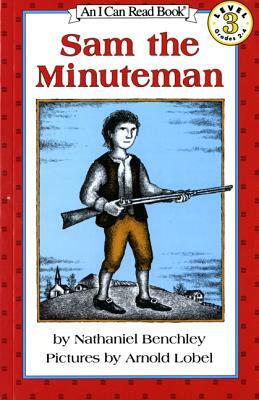 Sam's father was a Minuteman. Sam was ready in a minute. Father and son rushed to the village green. Other Minutemen were already there. Through the long night they waited and waited. Then, at dawn, the soldiers came! In this exciting I Can Read Book, Nathaniel Benchly recreates what it must have been like for a young boy to fight in the Battle of Lexington. Arnold Lobel's vivid pictures give a poignant reality to the famous battle that marked the beginning of the American Revolution. Nathaniel Benchley was the author of several different types of books, as well as plays, movies and magazine articles. He attended Phillips Exeter Academy and Harvard College, majoring in English. Shortly after graduation, he married Marjorie Bradford, and they settled down in New York City, where he worked for several newspapers and magazines. In 1941, before the attack on Pearl Harbor, he joined the U. S. Navy and was later trained to command small PT attack boats. He served in the Navy in the North and South Atlantic theaters and was on his way to the Pacific campaign when the war ended in 1945. He returned to New York and joined his wife and five year-old son, Peter. The next year, they had another son, Nathaniel Robert. Nathaniel Benchley worked as a freelance writer –and painter- for the next 36 years. He wrote novels, plays, short stories, reviews, movie scripts and a very popular biography of the actor Humphrey Bogart. Much of his material was drawn from his life in New York and Nantucket, MA, where the family had a summer home. He found the small town life in Nantucket was rich in characters and material for adventures. He wrote a book titled The Off-Islanders, which was later made into a successful movie called "The Russians Are Coming! The Russians Are Coming!" It was the story of a Russian submarine run aground on a small New England island. Several of his other books were also made into movies. His sideline as a painter of landscapes led to his participation in many gallery showings. Mr. Benchley used his fascination with history to create a series of books for beginning and teen readers. His particular interest was in taking a moment in history and examining it through the eyes of a young boy. He told stories about the Vikings coming to what would later be called "America;" Native American Indians dealing with the new settlers in their land ("Small Wolf"); young boys in Colonial America ("Sam the Minuteman" and "George the Drummer Boy") and the movement west; and a young boy who joins the Navy during World War II. He also wrote a series of books for very beginning readers, many of which were about animals and their special bonds with humans ("Red Fox and His Canoe," "Oscar Otter"). He was always proudest of the letters he got from young readers who had identified with one of his characters and wanted to ask questions raised by their reading. He personally answered every letter he got from his readers. In 1974, his son, Peter, published his first novel, Jaws, based on his experiences fishing off Nantucket in his youth (and a healthy imagination). For the last many years of his life, Nathaniel Benchley lived in Nantucket with his wife. Nathaniel Benchley lived by the motto: "A craftsman is one who does what he is given to do better than others feel is necessary. "He died in Boston, MA, in 1981. Arnold Lobel (1933-1987) was the award-winning author and illustrator of many beloved children's books, including the classic I Can Read books about Frog and Toad, and the Caldecott Medal winning Fables.